What dessert can one make for Sunday lunch with friends on a hot summer day? 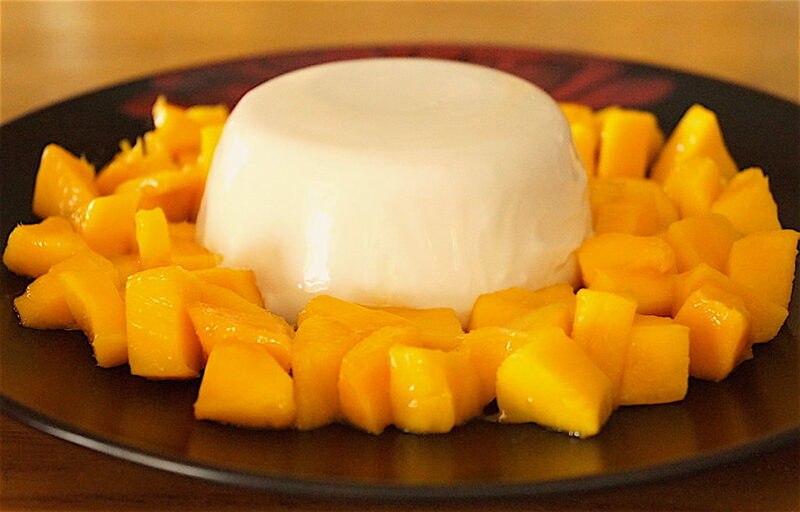 Anything actually, but since it’s mango season and sweltering outside, I thought I’d go with something light, cooling and seasonal, so I went with a coconut panacotta, which is essentially a creamy jelly. After a heavy meal of cheesy quiche and mutton lasagna, the lightness of the coconut panacotta with the freshness of mango was the perfect ending. Thailand on a plate. It was much appreciated by all, though the panacotta came out a little more like custard instead of a soft jelly, which is more firm, as I hadn’t added enough gelatine for the existing mass. I had also added 200 ml of coconut milk to the mixture which made it lighter. This time I thought I’d tweak the recipe a bit. I omitted the coconut milk to get a denser texture and it came out perfect. It slipped out of the container and held its shape but not before at least one fiasco. If you’ve read most of my posts you’d know that these fiascos are the norm while attempting to create dishes specifically for the blog, but the good thing is that you and I get to learn from my mistakes. The first time I tried to slip the panacotta out of its container, I dipped the container in hot water for too long, as a result, the panacotta melted too much from the bottom and plopped out in a semi liquified blob. I dunked the second container in hot water for just three to four seconds and that worked fine. You may have to work the arm muscles a bit though, shaking the container on the plate to get it to loosen up. You could make all this effort, or just pour the panacotta into really nice ramekins or serving containers to set and just eat it out of that. 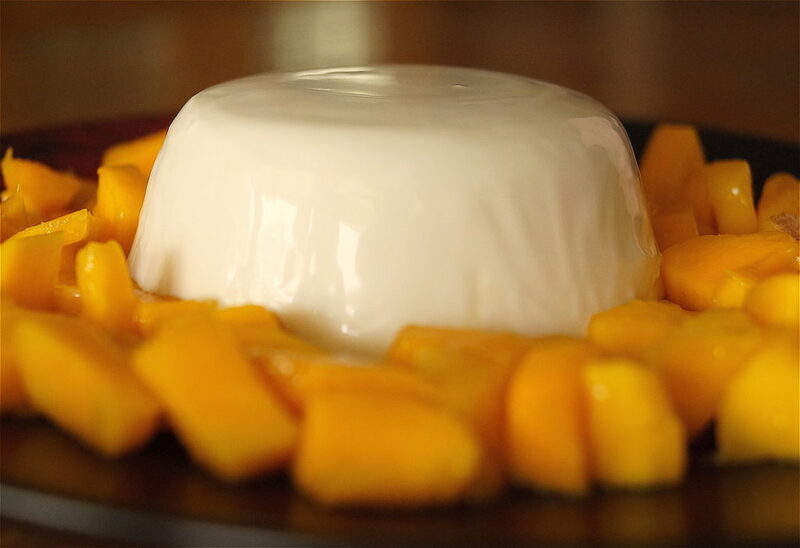 Word of advice – The time it takes the panacotta to set will depend on the cooling capacity of your refrigerator. An underperforming fridge under intense heat conditions will not set your panacotta to your expectations in the mentioned time frame. You may have to keep it overnight. Or you could just keep it in the jar. 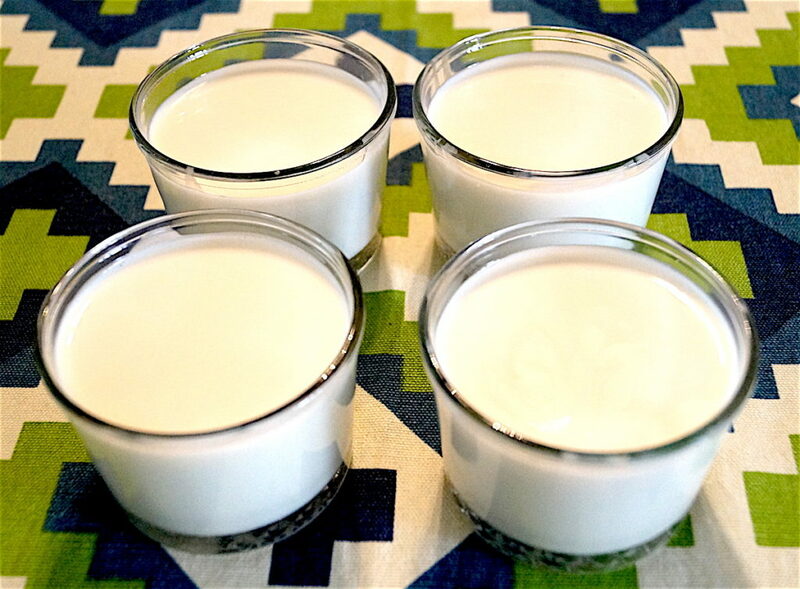 The texture of the panacotta should be soft and creamy. It should not be rubbery, which happens when you put excess gelatine. Try this recipe out. You may be happily surprised. 4 mangoes diced into 1 cm cubes or sliced thinly. In a small bowl, add 2 tablespoons of room temperature water to the gelatine and let it sit and bloom. Keep for at least 10 – 15 minutes. Mix the coconut cream, cream and sugar in a heavy bottomed pan and heat on medium till it comes to a boil all the while stirring to make sure it doesn’t burn. As soon as it comes to a boil turn the heat off. Add the bloomed gelatine to the cream and mix well so that there are no clumps. You can add this in small batches too, all the while stirring so that it melds well. Pour the mixture into desired containers, wait till they’re substantially cooled and chill in the fridge for a minimum of four hours or overnight. 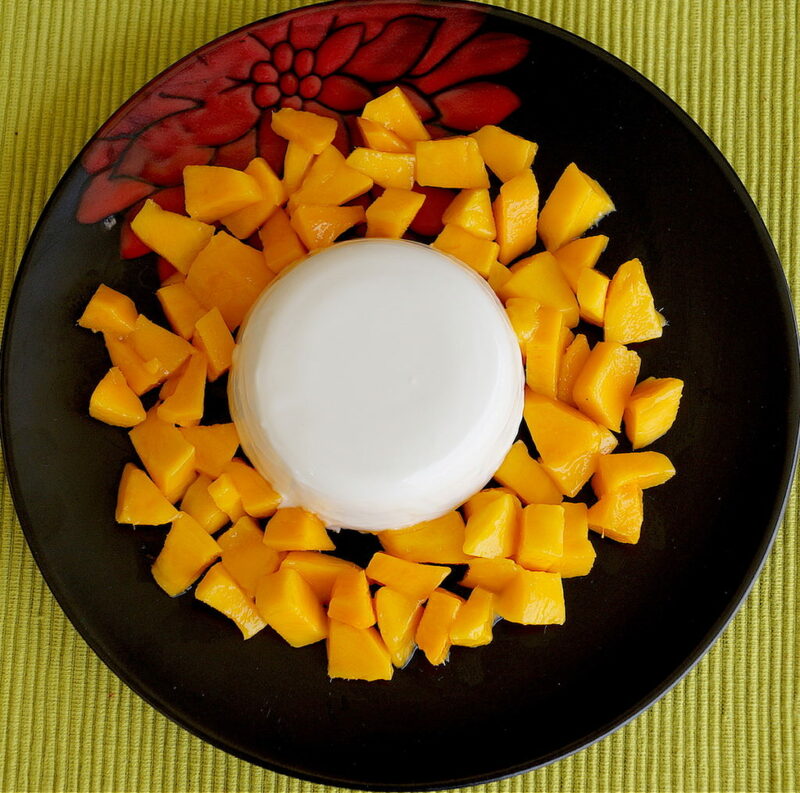 If you want to serve the panacotta out of the container onto a plate, dip the container in hot water for 3 – 4 seconds and turn it over on to a plate. Enjoy it with the mangoes. Important notes: Make sure the gelatine has blended nicely with the cream mixture and there are no gelatine lumps. Don’t keep the set panacotta container in hot water for more than 4 seconds in your attempt to loosen it. It will melt too much and ruin all your hard work (especially if you have an underworking fridge! ).